I helped host a garden party yesterday. I was in charge of decorating seven dining tables and the buffet table. I wanted to do something simple, inexpensive and garden-y. 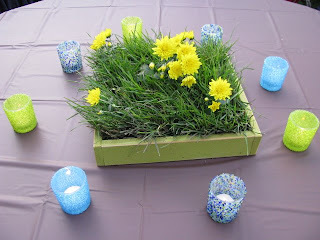 I decided to use grass for the centerpieces. 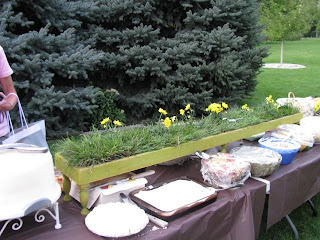 I thought about growing wheat grass, but then came up with an even easier idea. . .buying sod. I just needed something to put the grass in. I could have bought baskets but, at my house, it's much cheaper to build something than to buy. Fortunately I have a very supportive husband, (he really likes it when I give him a lot of compliments on my blog) who helps me carry out my ideas. We bought cedar fencing and used it, and scrap wood, to build shallow square boxes to hold the sod. I like the fencing material because it smells good and it's roughness gives the project a rustic look. I painted the boxes with "oops" paint, then sanded them to give them an aged appearance. The sod was cut to fit inside each box. I purchased a mum plant and cut it apart. The stems of the mum are stiff enough to stick into the sod and stand upright. The sod boxes were surrounded with votive holders that I purchase at a dollar store (3/$1). The holders were also gifts for the guests. I had tea lights burning inside, then they were sent home with new scented votives. a perfect size for the buffet table. we added six small balusters for legs. 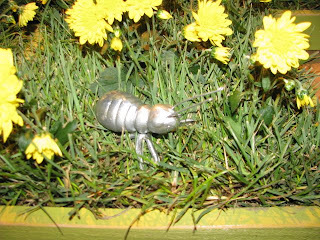 I used my little silver insects to help decorate the buffet table, too. The event was a lot of fun! What a wonderful idea! I've seen wheatgrass done before (especially at Easter time) but never sod. I like the way you elevated the box on the buffet table, too. Very cute, such a cheerful table! You have just outdone yourself again. Love the large piece on the buffet table. Will you be repurposing it in your garden? That makes me hungry! It also makes me want to wear a cute dress. What cute ideas for the table! absolutely splendid! i love the whole post, but i really, really love the idea of sending home new votives with the candle holder favors. it's all in the small, sweet details! WOW...Joy I think you out-do yourself on each post!!! 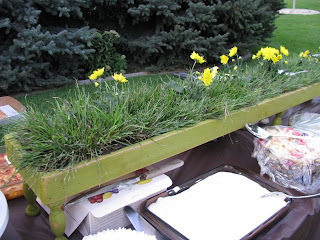 WHAT a cute idea for a garden party luncheon! Absolutely adorable! PS...Joy come over and give me a suggestion on my blog today..I need help! That looks sooo awesome. YOu did a great job with the buffet table. The mums look so lovely and bright. Some people are sooo good. love it! Have a lovely day...come by for a visit. What a clever idea. So fun and festive. I actually just stumbled on your blog and took a good long look... I love all your ideas. They are great! Where do you come up with this stuff??? A-dorable. Will be stealing this for one of two bridal showers I'm helping with in the spring. I LOVE it. 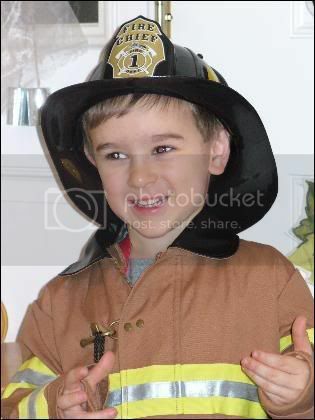 How fun and how cute!! You are so creative! If that doesn't say "garden party" I don't know what does! I just love how you can take a simple idea and turn it into something MARVELOUS! What an adorable way to decorate a table!!! that was such a good idea...looked great! so cute! I love the idea of using sod! Once again, you amaze me! Love garden parties. Sounds like a wonderful way to soak up the last remaining days of summer. I think fall is already here in Iowa..winter won't be far away! It all looks wonderful! You are so good and you know it!!! fabulous, like usual! what power tools/tools do yall use for all your wood working projects??? I want to assemble a pack to have here and do our own projects... another thing.. i messed up a spray paint a table project but I don't know how.. it looks splotchy.. i wanted to know what your secrets are.. I sanded w/ 220 (didn't prime b/c the primer i bought was for metal, oops) and spray painted 2 coats then used spray paint lacquer.. HELP!! Another great idea. Absolutely adorable! OH MY GOODNESS!!! This is too cute! I love the idea and the buffet table with the box on the legs is a wonderful idea. You better keep that hubby...but it's you who comes up with the ideas!!! New here. Very nice blog. What fun decor! What was the occasion? I love the long box you used to spruce up the buffet! That would be a fabulous centerpiece in the middle of a long dining room table! You are lucky to be able to whip up such wooden craftmanship with ease!!! So well done. Just so you know, I often find things at the second hand store that I think you will like. I wish you lived closer and we could go. Such a cute idea! I think it is awesome that hubby likes to build things for you. Sod is fantastic! We put sod in cigar boxes ( of various types) with daisies from my garden for my son's wedding. He really wanted the cigar boxes and we weren't really sure what to put in them. Grass seemed to suit the barbeque event. We also did a candy bar (noon barbeque). Each setting had a cellphane bag with a sticker (of the bride and groom's picture) to close the bag once they filled it at the bar. The candies were in various vases from IKEA so candy could be poured out (no touching) Thanks for letting me share. How wonderful...I love arrangements with the "grass". 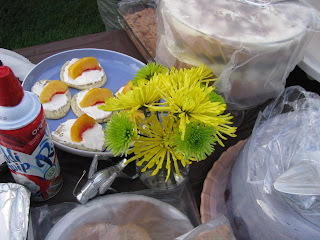 A garden party sounds so fun...the smallest details is what makes and event so special! Too clever! Glad you were able to get out and attend a garden party. Out here our "garden" weather is turning into raking weather and I think I may have to get our my fall today. I always love coming to your blog. There's always such great inspiration here. Thanks for sharing!! I just thought I'd let you know that I have added to you my blog favorites list! I'm more than a month late on this one, but it's a great idea. I"m hosting a baby shower next month and I wanted to try some different things for decor. Love the idea and I'll post what ever I end up doing in my blog next month. Take care.